Description: She's your new favorite. She's everyone's new favorite. And now she's joining the big leagues. Look out world, Kamala Khan is officially an Avenger! But will being one of Earth's Mightiest Heroes be everything she imagined? Or is life as a celebrity harder than she thought? But while saving the world is important, Jersey City still needs its protector too. A development company that co-opted Ms. Marvel's face for its project might well have more in mind for gentrification than just real estate. 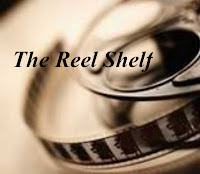 Can Kamala take down the evil suits destroying her home without ruining her personal life? Speaking of which, who exactly is that with Bruno? Get back on board and cling on, Kamala Korps, the ride is about to get wilder than ever! Review: Volume 5 is possibly my second favorite Ms. Marvel comic after its debut volume. This fantastic volume incorporates everything that I love about this series, mainly a good balance between Kamala's civilian life and that of her being a superhero. In this volume Kamala's stress level is at an all time high. She is struggling to balance friendships, family, and superhero-ing, especially now since she is an official Avenger. Let's just say that it is not going well. I liked how this volume showed how Kamala despite her superpowers, ethnicity, and religious affiliation is like the ordinary person. We can easily empathize with her when her best intentions fall flat and nothing seems to be going right. Thankfully, this volume is not all about Kamala's angst but there is other light moments developing in this volume such as Aamir's wedding and Bruno starting a relationship which are both equally adorable. Like the other volumes of this graphic novel series, there are guest appearances that are fun to read. The writing remains strong though the illustrations are inconsistent as the illustrator tends to change. Words of Caution: There is some strong violence and minor language. Suitable for middle grade readers and up. Description: While CIVIL WAR II brews, the next generation of Avengers has bigger things to worry about - like a tri-state academic competition! As rival schools clash, Ms. Marvel's teammates Spider-Man and Nova are now her enemies! But when Kamala gets called to the real battle's front line, she faces a fight she can't embiggen her way out of. She's about to learn a valuable lesson: Never meet your idols! As war intensifies, tragedy strikes too close to home - and Ms. Marvel must choose between her heroes and her family. 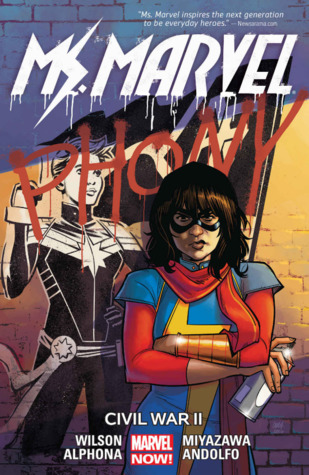 When friends become foes, Ms. Marvel struggles to put her life and Jersey City back together. Kamala will be forced to grow up fast and find her true place in the world. But will she be an international sensation...or a menace? Review: I didn't care for the Marvel Civil War tie-in in this volume except meeting the awesome Miles Morales aka Spiderman, but I did love the overall theme of various types of action-mainly taking a totalitarian/aggressive approach of nipping things at the bud when you can only anticipate things happening and give up free will/choice or take another completely different route? Wilson plays this scenario out as Captain Marvel and her agents have created a device that can anticipate crime before it is happening ala Minority Report. Things don't turn out right and leaves Kamala shaken to her core. Her symbol of standing up for good is changed in her community and her beliefs of being a superhero are challenged. I loved how Wilson incorporated Kamala's family flashbacks to the India-Pakistan partition, a bloody time period and the biggest human migration noted in history, showing how Kamala's mother's actions and emotions at that tumultuous time mirror Kamala in present day. 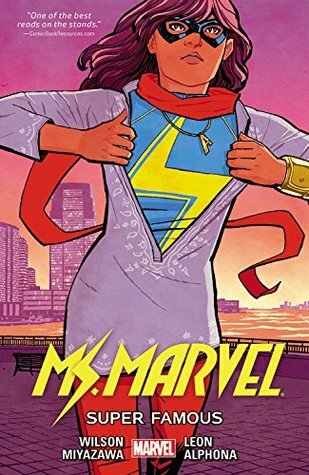 The motif of going back to your roots in order to gain perspective also works well in this volume as Kamala goes to Karachi, Pakistan, to visit family and put Ms. Marvel aside only to learn why she needs to be Ms. Marvel. This sounds like a fun series for students with lots of light moments.